Each year I look forward to Valentine’s Day with eagerness and anticipation. It’s not the chocolate and candy hearts I crave but something much more satisfying. 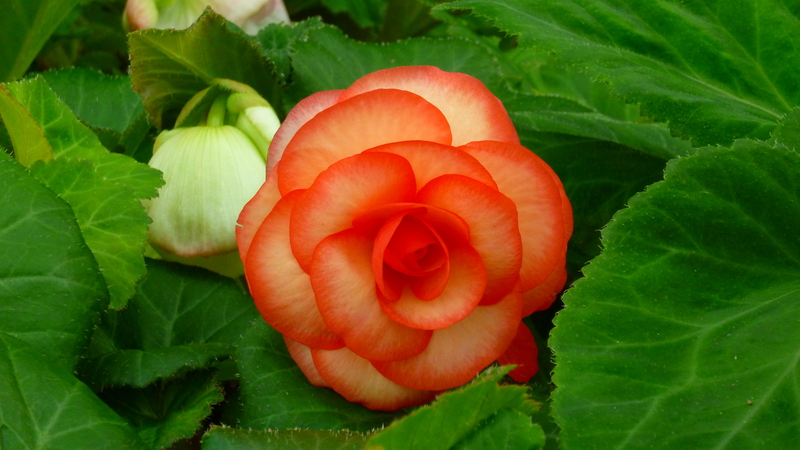 That mid-February love-filled holiday marks the start of the Tuberous Begonia growing season here at the farm. And tending these Begonia beauties is what I love! 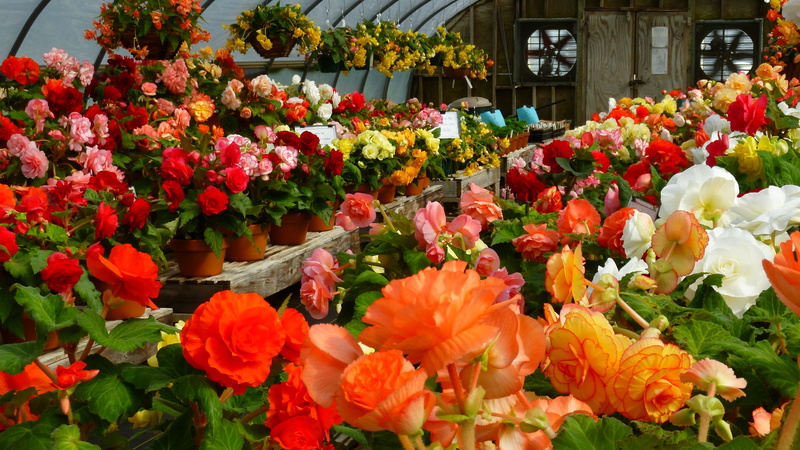 Each summer, our display of Tuberous Begonias attracts visitors from hundreds of miles. 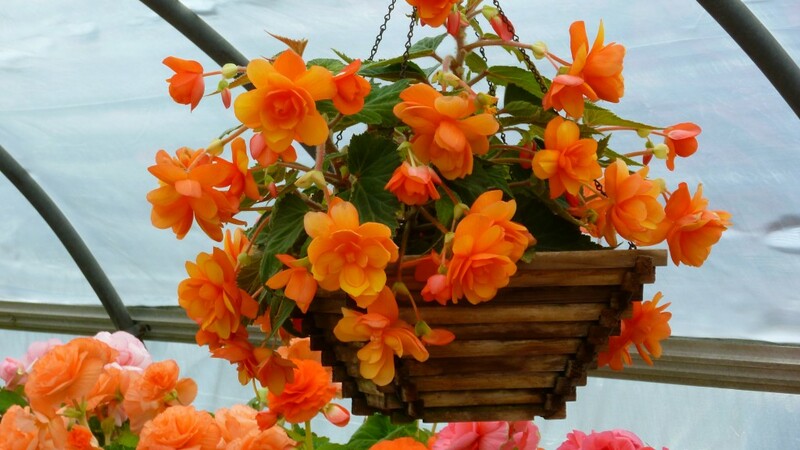 Our collection of the English-bred Blackmore & Langdon Tuberous Begonias showcases more than 70 varieties of this fantastic strain of Begonias. Perhaps it’s a rare sight to see on this side of “the pond” . . . so many B&L varieties all together composing a colorful symphony for the eyes. 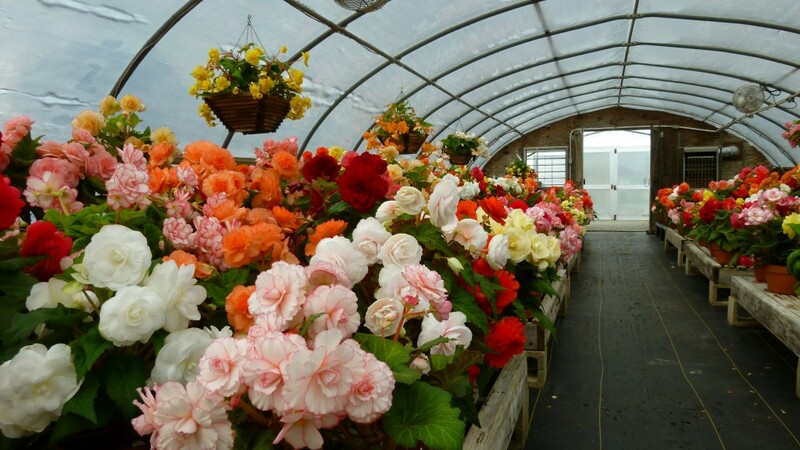 The Tuberous Begonias, wrapped in paper for winter storage, are brought out of the root cellar on Valentine’s Day. 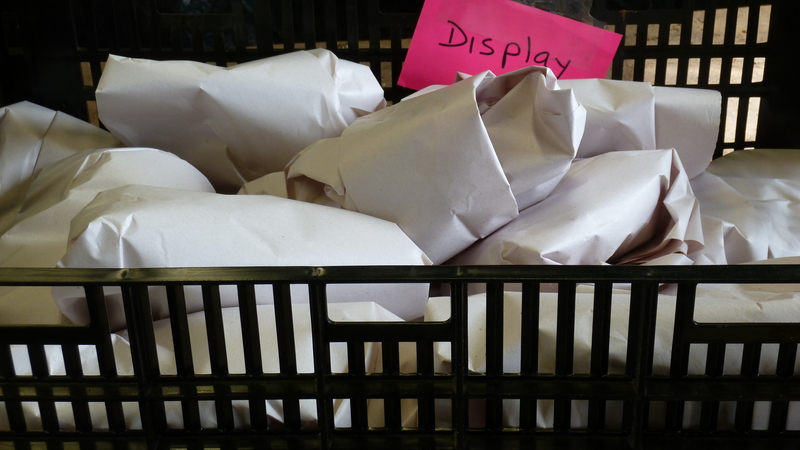 I keep the display tubers from year to year. 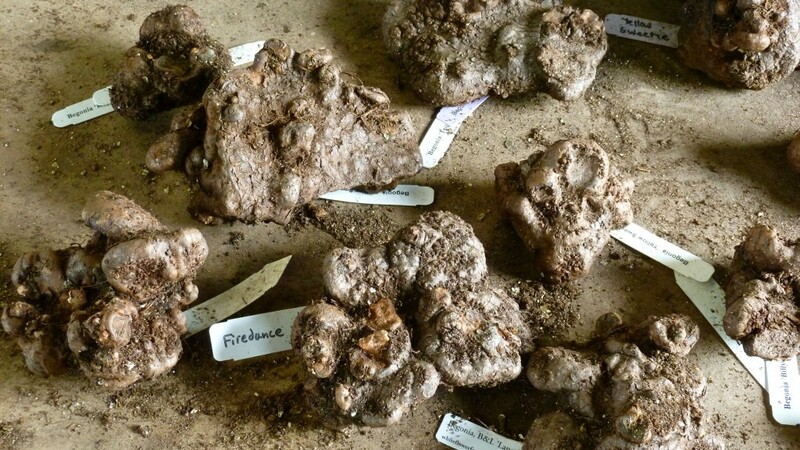 The age of the tubers ranges from 2 to 15 years old. The tubers have been in winter slumber mode for nearly 3 months . 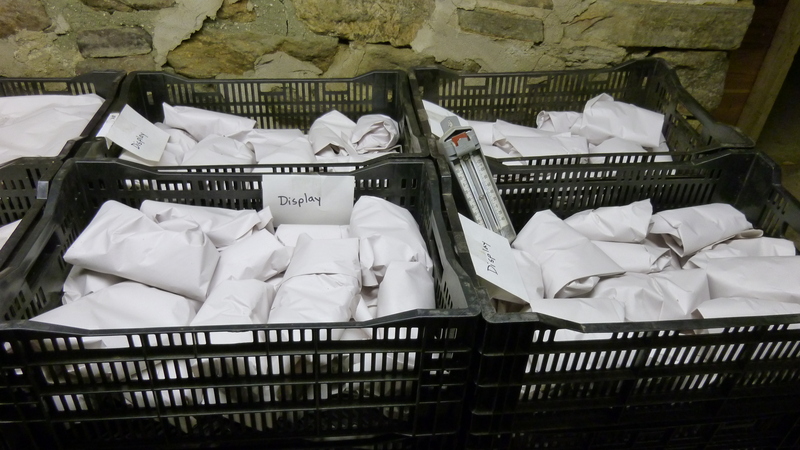 . . each tuber wrapped in a paper blanket with its name label tucked inside. They have been carefully nestled into lily crates, the heaviest tubers on the bottom. The guest cottage here has a fabulous dirt cellar where I store the tubers. 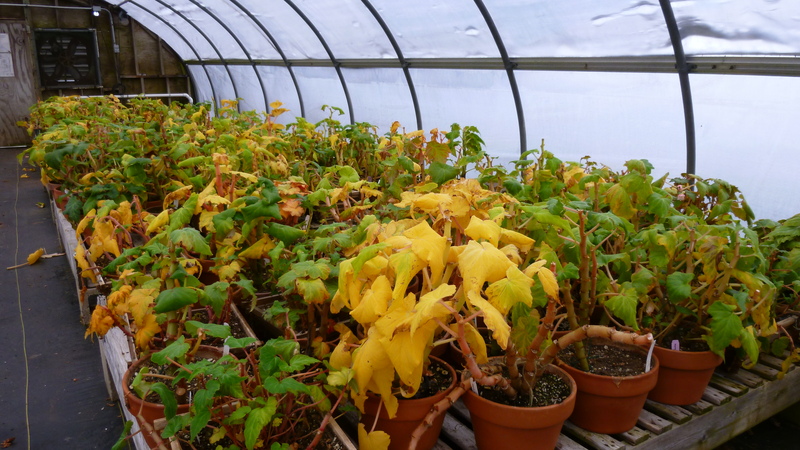 The temperature hovers around 50 degrees F.
Our tubers range in age from 2 to 15 years. It’s important to keep a tag with each one so you know which is which. 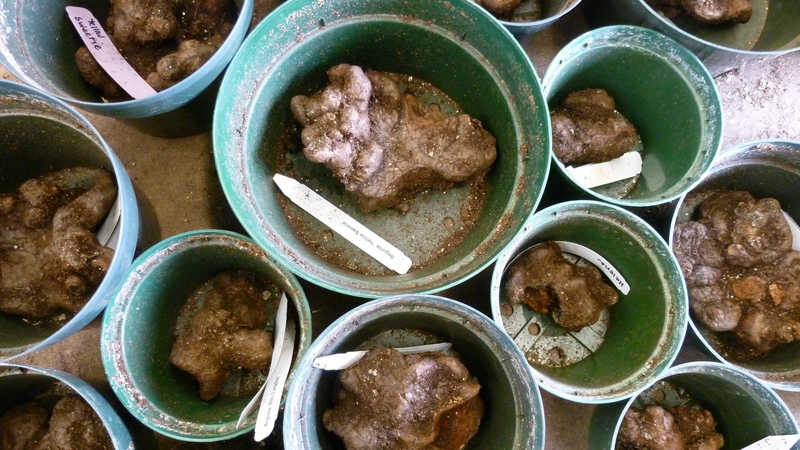 I like to have all the tubers potted up by March 1. In between Amaryllis photo shoots and garden planning sessions at my desk, I scramble about scaring up plastic nursery pots of various sizes, anywhere from 4” to 10” diameters. 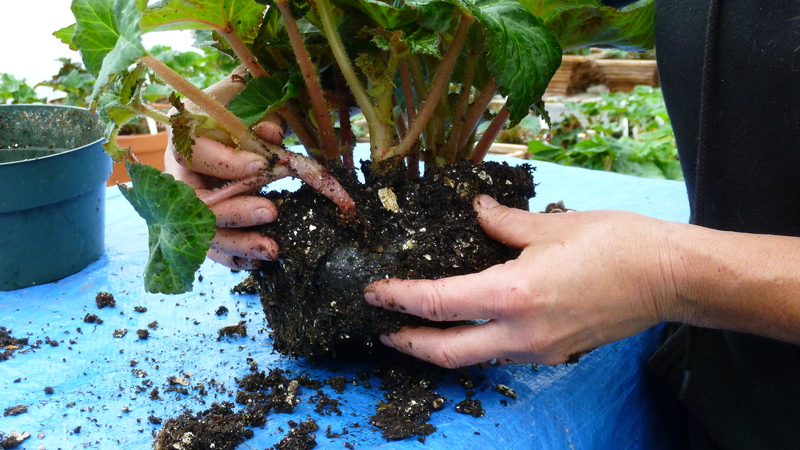 Barrels of Begonia soil are churned out for me by our potting department. On potting day, I carry my crates of precious cargo up from the basement to my potting station in the headhouse. And then, the fun begins. 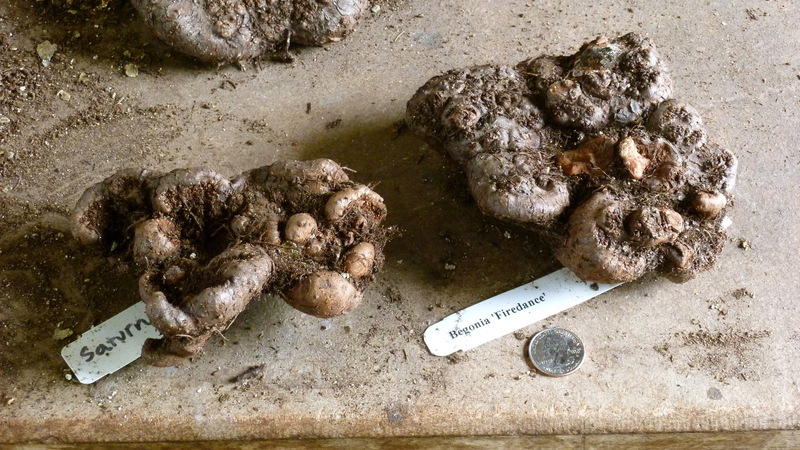 The size of the tubers varies considerably. 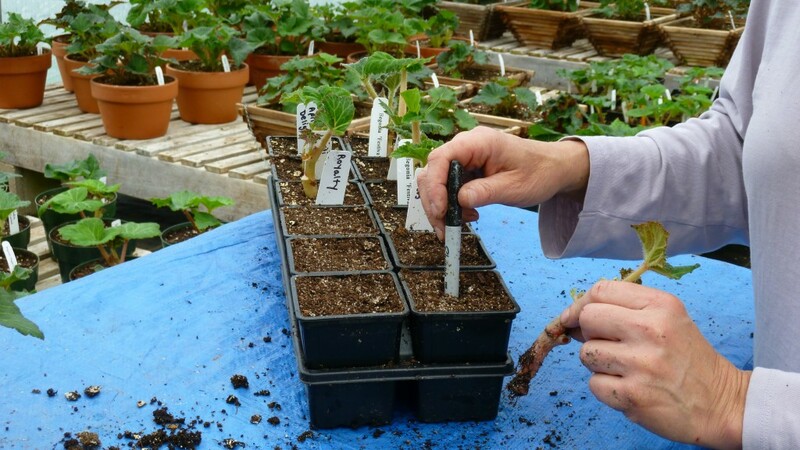 Working through a crate at a time, I unwrap each tuber and, after a brief health examination, lay them out on the table being careful to not separate the name label from its owner. I keep a running inventory of the varieties and how many I have of each. Ideally, I like to have at least 3 of a variety because these are living beings and sometimes I do lose a few to rotting in storage or during the growing season. It’s a sad day if I lose a tuber that was my sole representative of a variety. 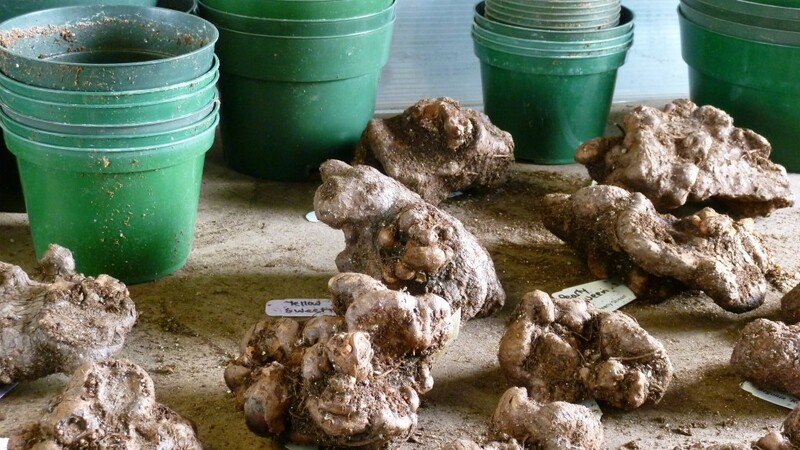 When selecting a pot for each tuber, choose one that’s just big enough to hold its occupant. 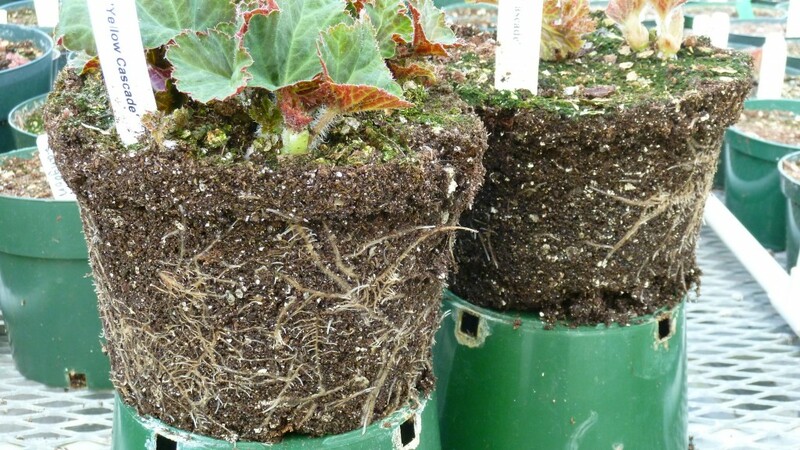 The plants will be transplanted into larger pots once they’ve rooted in the first. 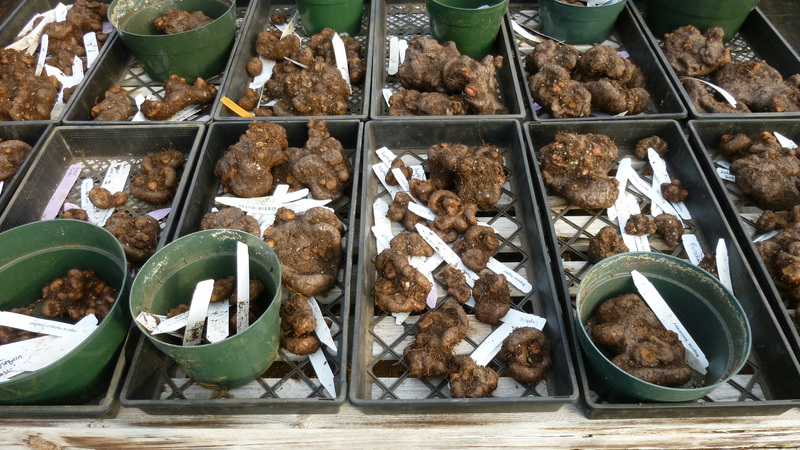 Here are the tubers nestled in their pots. I assign each tuber to a pot that is just big enough to hold its occupant. 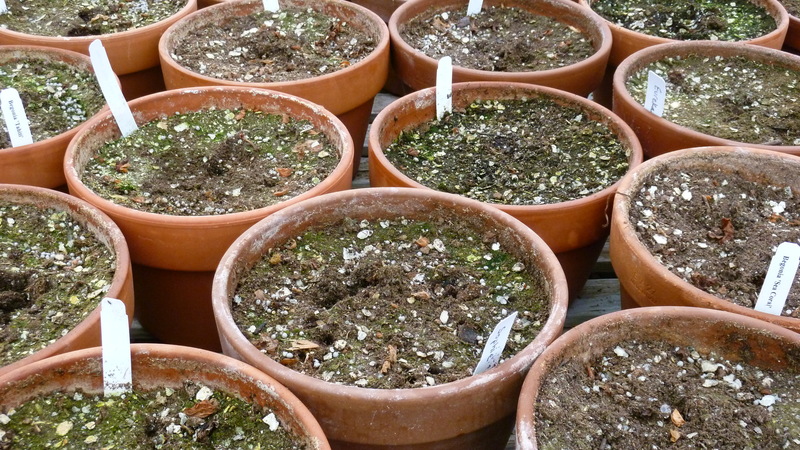 This is only round one in the potting process. 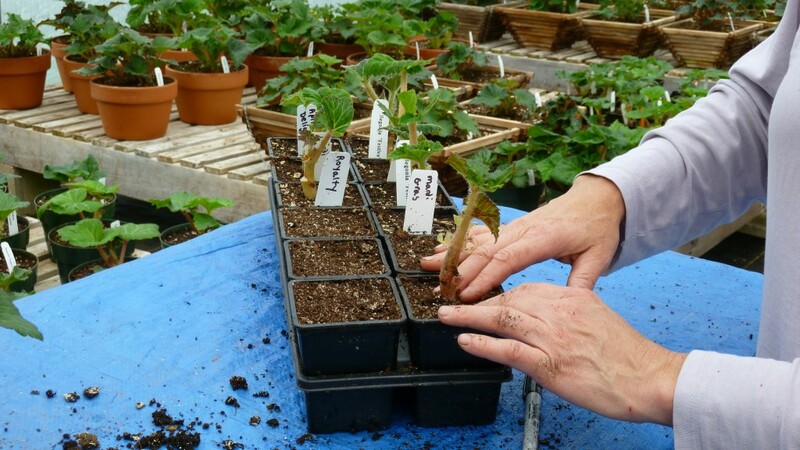 The plants will be transplanted into larger pots once they’ve rooted into the first. 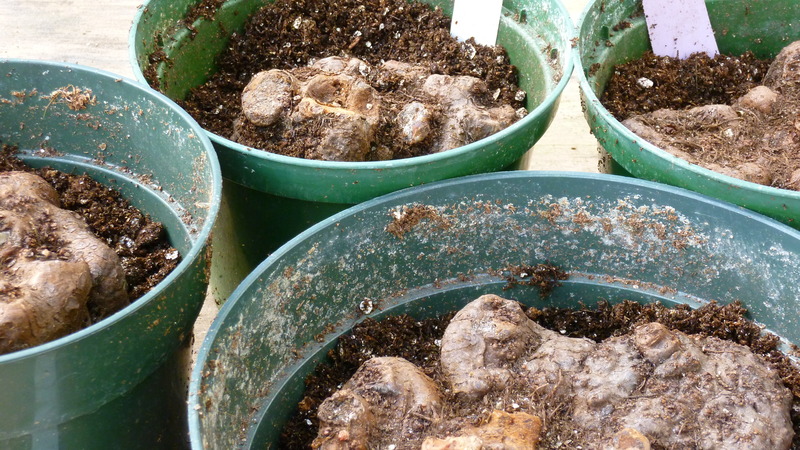 I find that stepping the tubers up in this way decreases the chances of rotting tubers. 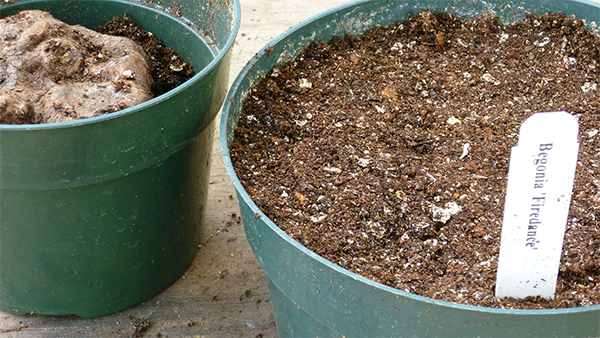 Putting a small tuber in a large, moist soil mass before the tuber can get growing can sometimes have disastrous results. 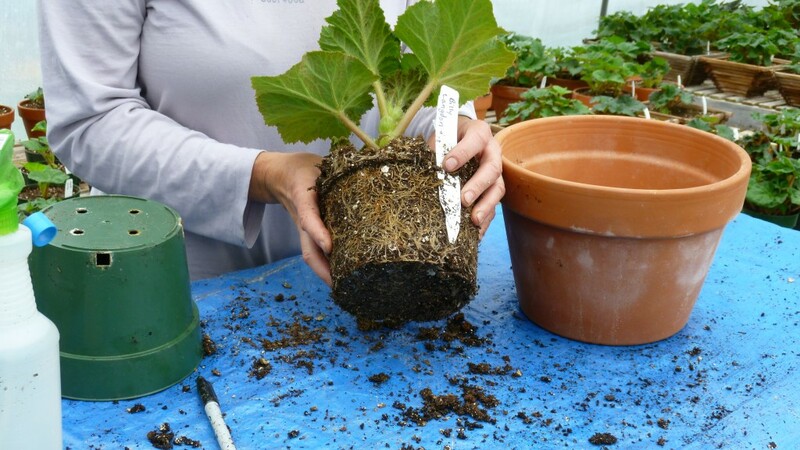 Fill each pot about halfway with potting mixture, and settle the tuber in, making sure its eyes are looking up. Actual potting is easy. I put soil in the pot and place in the tuber making sure its growing eyes are looking up. 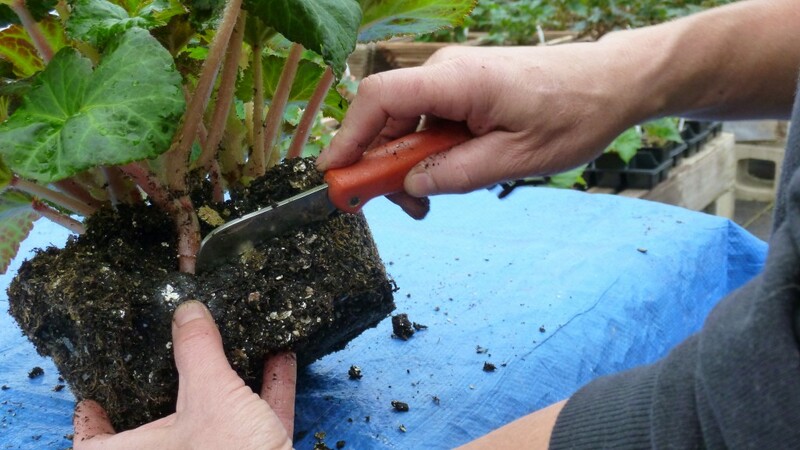 I add soil, firming in around the tuber as I adjust its potting depth. I like the surface of the tuber to be no more than 1” below the soil surface. 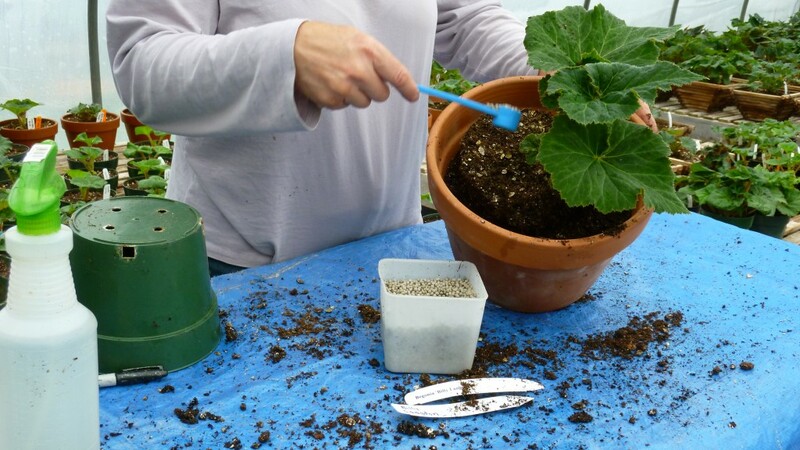 Add soil, firming in around the tuber and adjusting its potting depth so the surface of the tuber is no more than 1″ below the soil surface. The pots then take up residence shoulder-to-shoulder in our warm and cozy propagation house surrounded by the freshly rooted cuttings of annuals and tomato seedlings. I give everyone a good drink of water and then I wait. 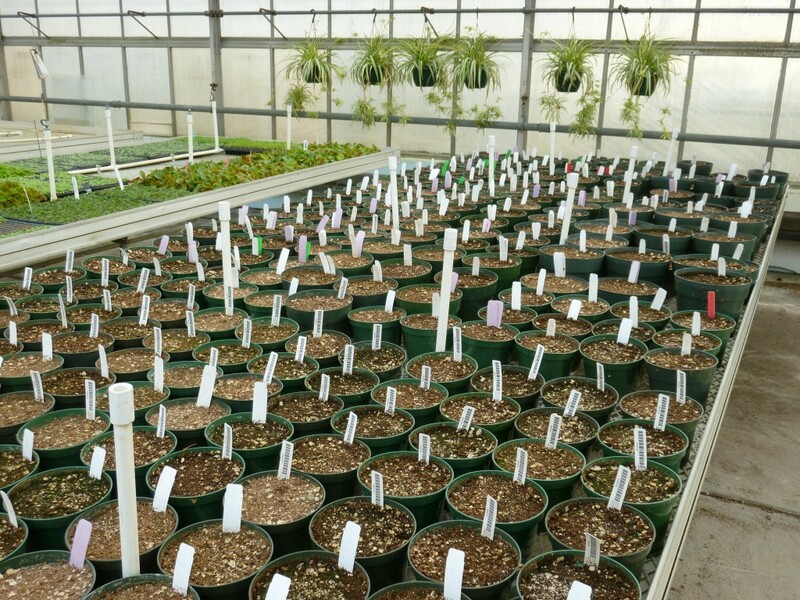 Properly potted and labeled, the tubers take up residence in our propagation house, surrounded by freshly rooted cuttings of annuals and Tomato seedlings. 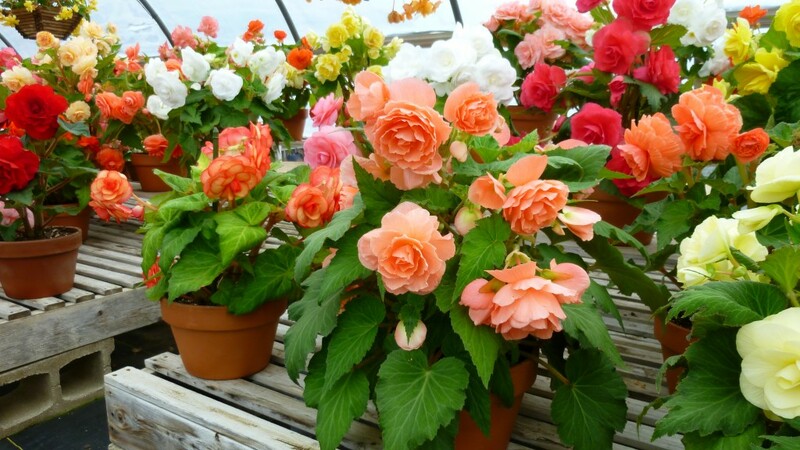 Our Tuberous Begonias begin shipping around mid-March, and you can pot them then. 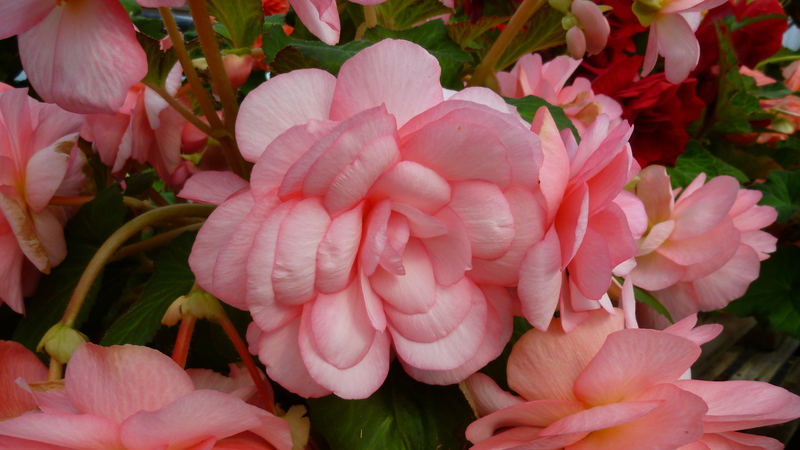 For information, see our Grow Guide, and watch our video, How To Grow Tuberous Begonias. 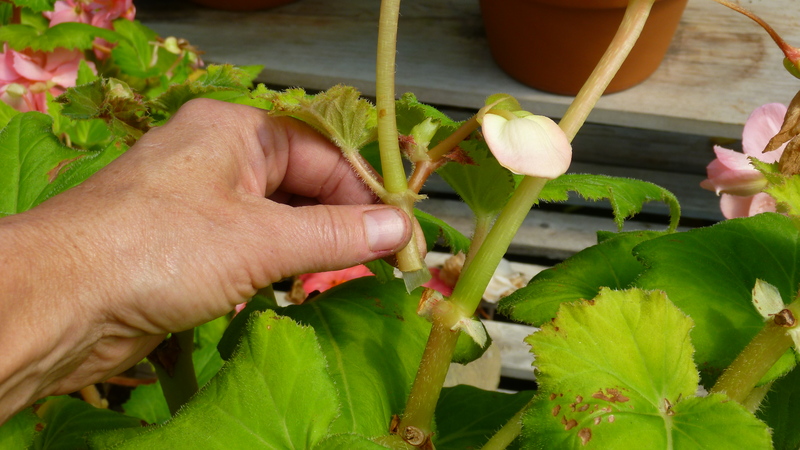 The first two or three weeks after potting tuberous begonias I don’t expect to see anything happening. 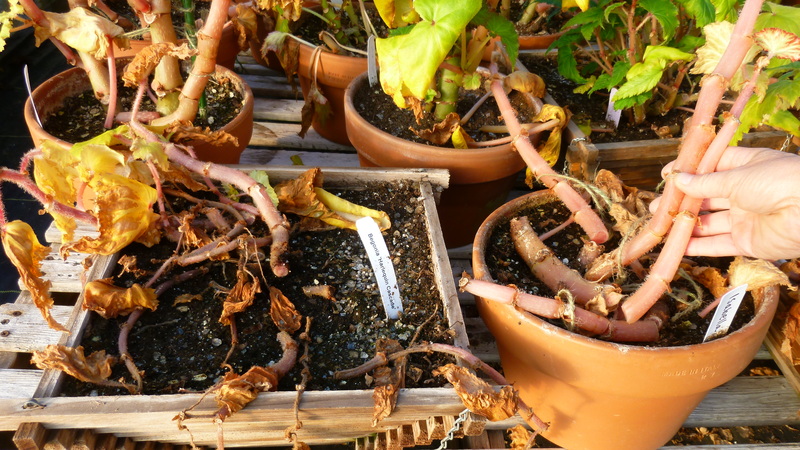 I check in on the potted tubers weekly, providing water to the occasional pot if the soil has dried out. All appears quiet and peaceful on the surface, but I know there’s a bevy of activity going on below. 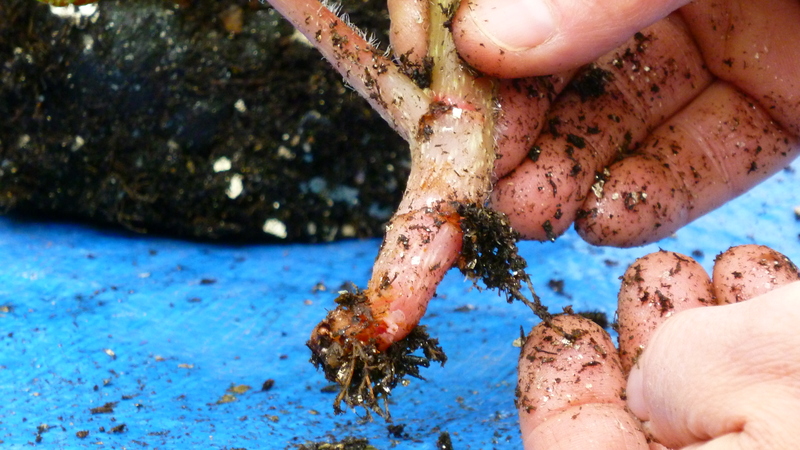 First on the Begonias’ to-do list is to make fresh fibrous roots, and they get right to it. 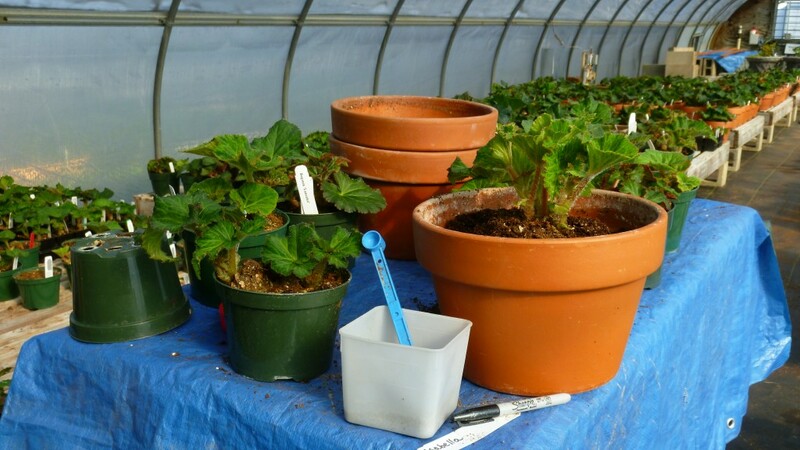 The spring sunshine boosts the greenhouse temperature during the day and warms the soil in each pot. The tubers awaken and respond to this cozy environment. 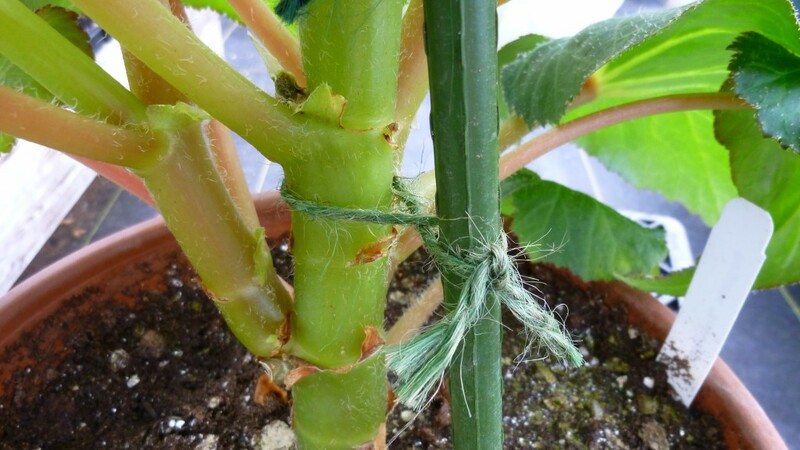 First on their to-do list is to make fresh fibrous roots, and they get right to it. Simultaneously, the eyes of the tubers start to expand just like they would on that potato that might be hanging around on the kitchen counter for too long. It is from these eyes that the stems and leaves will form. Cracks and fissures begin to appear on the surface of the soil as if tiny earthquakes had occurred. Fresh and fuzzy leaves are eagerly pushing through the soil. And then . . . finally . . . halfway through week four, I see it and my heart skips a beat. Something is happening! Cracks and fissures begin to appear on the soil as if overnight the Earth shook and tiny earthquakes had occurred. Peering closer into each crack I can see the fresh and fuzzy leaves eagerly pushing through the soil determined to see the daylight. It makes me think of butterflies bursting forth from their cocoons, and I smile. 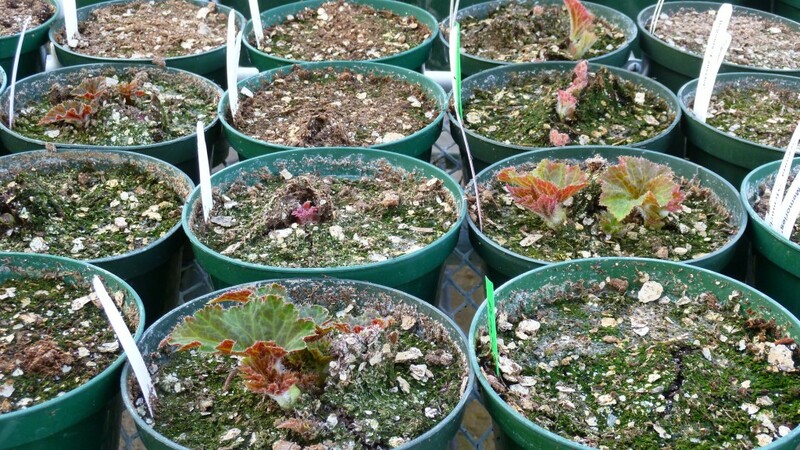 It won’t be long before these babies will be packing up and moving to the begonia display house for the summer season.